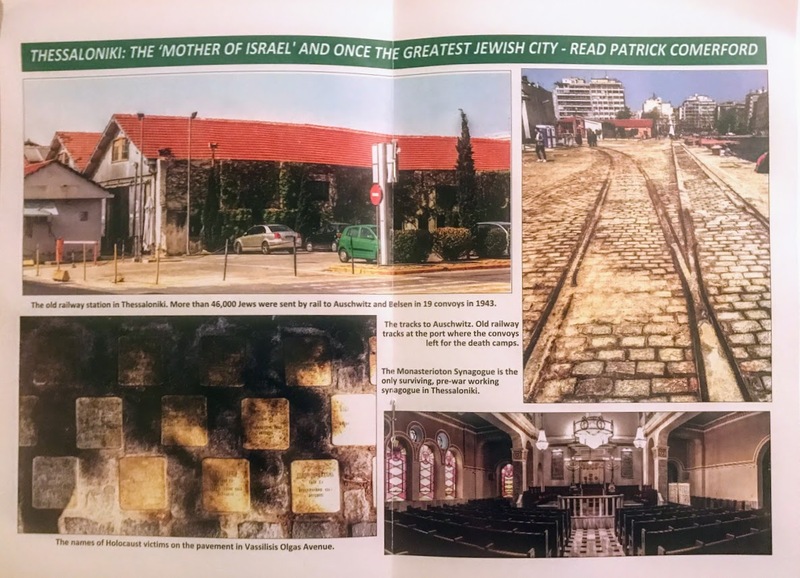 My monthly column in this month’s edition of two diocesan magazines – the Church Review (Dublin and Glendalough) and the Diocesan Magazine (Cashel, Ferns and Ossory) – tells the story of the Jewish Community in Thessaloniki. This was once a prosperous community that was centuries old and that gave Thessaloniki its reputation as the ‘Mother of Israel.’ But it was almost annihilated by the Nazis during their occupation of Greece in World War II. I visited the Jewish community in Thessaloniki during Easter this year, including synagogues, museums, monuments and former homes and businesses, as well as the train tracks that marked the beginning of the journey from Thessaloniki to Auschwitz. My feature and photographs are spread across seven pages in this month’s edition (June 2018) of the Church Review. In addition, the editor has provided a two-page colour centre spread of four photographs to highlight this feature. But more about the Jewish Community of Thessaloniki and its interesting history and tragic stories tomorrow afternoon.